4&20 Blackbirds : Top O' The Mornin' To You! OOOH I Love today. There is not a lick of Irish in my blood, but oh how I love St. Patrick's Day. I cook Corned Beef a few times a year, but it never tastes as good as I does on this day. 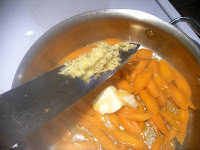 Here is a recipe for the carrots we will have with our Corned beef, braised cabbage and potatoes, and fresh rolls. I will post the recipe for the Corned Beef later, as it is currently cooking. Now folks, i try not to rant about what items to use too much but in this case I must. 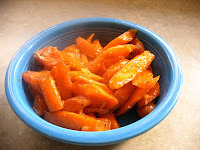 I understand that those Pre-peeled carrot nubs are quite popular, but they don't taste half as good as a beautiful and sweet carrot, that you peeled and cut yourself. As a matter of fact, it is rare I can find any flavor in items that are prepared like that. 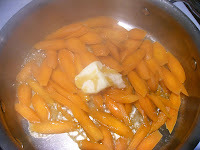 Try to buy carrots that are not so fat, the smaller ones are more flavorful. 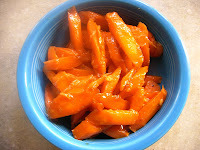 8 medium carrots, peeled and sliced at a bias. 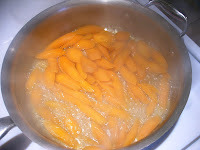 In a skillet, add 1 cup of water to the carrots and steam for about 5 minutes until tender. Drain off any remaining water. Add 2 Tablespoons butter and 2 Tablespoons honey. Next, add 1 teaspoon horseradish (prepared-not creamy) and a scant 2 Tablespoons fresh grated ginger. mmmmm. 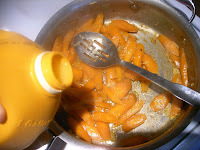 Lastly, add about 2 Tablespoons orange juice and cook until there is no liquid in the bottom of the pan. Season to taste with salt and pepper. You can sprinkle it with a bit of parsley if you like. carrots will never be the same again! I'm coming to your house for dinner tonight!! !